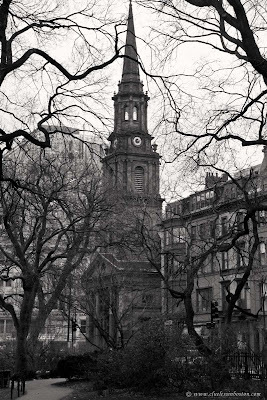 This is a view of the Arlington Street Church on Arlington Street, just across the street from the Public Garden. The present Arlington Street Church-building was constructed between 1859-1861 on newly filled land in Boston's Back Bay by members of the historic Federal Street Church. The church is noted for its Tiffany windows. fantastic photo! the colors are wonderful. Postcard beautiful. I think this church became famous during the Vietnam protests for allowing sanctuary for those who objected to the draft. Now there is a gloomy looking day.